Just thought I'd link to this, since it's pretty cool. Dan Meth has previously done a similar, awesome timeline of science fiction films, so I guess this was a matter of time. First thought: Holy Smokes he has Sodor! Second thought: Holy Smokes he has Thra! Third thought: Wait, he has Terabithia as a real place? Of course, it's problematic: the inclusion of Middle-earth means that the Haradrim apparently dwell in Moomin Valley (suddenly the Mumakil make sense! ), the Easterlings are rampaging through Wonderland, and the ruins of Beleriand are in Oz. Generally, I don't think it's a great idea to include any worlds that are meant to be earth in an ancient times: naturally, this would mean Middle-earth doesn't appear. This is a cool idea for worlds apart from ours, where one could possibly see them coexisting on some mass continent, preferably where only a few lands or kingdoms are detailed. I can imagine Oz, Narnia and Wonderland being neighbours. And, knowing me, they'd be going to war all the time. The Army of Oz allying with Narnia against the Queen of Hearts' invasion, perhaps? A couple of people have commented: where's the Hyborian Age? Or, rather, "Hyperborea" and "Cimmeria," nobody seems to have mentioned the dreaded "Hyboria" yet. Well, I think it's as unsuitable as Middle-earth, for all the reasons I stated above. 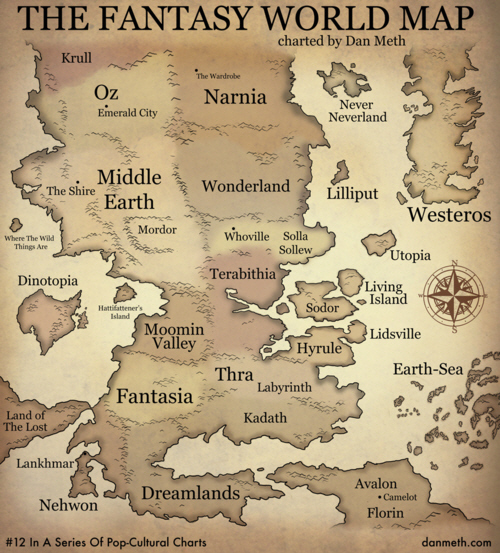 Assuming Dan's being geographically sound, even the part of the Hyborian continent Howard detailed would be the biggest part of the map - and then, what, would Vendhya be replaced with Terabithia? The only way I see this working is if the above is, in fact, The Nameless Continent - but then, that wouldn't work with "Marchers of Valhalla" and others. So, I'm not bothered by the lack of the Hyborian Continent, even if I am somewhat bothered by the inclusion of Middle-earth. Nor any of the other lands which are set on our world in a different time in the past, like Smith's Hyperborea, or future, like Smith's Zothique. Some other worlds are simply too vast to include: the world of the Young Kingdoms, for instance. The inclusion of Fantasia (surely Fantastica, Dan?) is also, by its definition, the entire realm of human imagination - so, really, the entire world should be Fantastica. And then you have the likes of Discworld, which... well, it's hard to translate a disc spinning on four elephants surmounting a gargantuan turtle into such a map. That said, I'm saddened by the lack of Prydain: it's based on Wales, so surely it could be snuck in somewhere. Amber, too, wouldn't be too hard to include. Nyumbani might be a tad massive (size of Africa, after all) but if we presume this was a particularly large planet, say twice or thrice the size of earth, it might still work. Putting Dinotopia near the Land of the Lost was a nice touch. 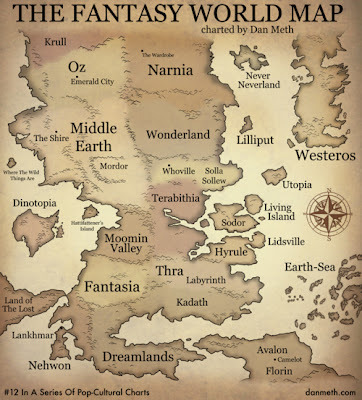 I agree that including Middle-Earth seems out of place, but I don't think it's because it's earth-in-the-past - after all, Dinotopia, Sodor, Lilliput, and Florin at the very least are at least nominally on "our earth" as well, some of them in quite modern times. No, I think my problem is the inclusion of worlds that are explicitly not-Earth - Narnia, the Dreamlands, Oz, etc. Not to mention that apparently the Dawn Treader sailed around Never-Neverland and Westros on the way to Aslan's country. But that last is a very fannish nitpick, I suppose. Also, what's that tiny island just under Middle-Earth? "Hattifattner's Island"? Aha, it's part of the "Moomin" setting. I agree that including Middle-Earth seems out of place, but I don't think it's because it's earth-in-the-past - after all, Dinotopia, Sodor, Lilliput, and Florin at the very least are at least nominally on "our earth" as well, some of them in quite modern times. That is a fair point: one could argue that some of those lands which are nominally part of "our earth" are really here, but are accessed via some weird portal thingummyjig, like the mist surrounding Skull Island. No, I think my problem is the inclusion of worlds that are explicitly not-Earth - Narnia, the Dreamlands, Oz, etc. Huh, interesting we have the opposite reservations. Not to mention that apparently the Dawn Treader sailed around Never-Neverland and Westros on the way to Aslan's country. But that last is a very fannish nitpick, I suppose. I feel he's underdone Dr Seuss a bit by only including Solla Sollew and Whoville, but there we go. I would really hope that Westeros isn't Aslan's country.. would be a really miserable afterlife.. I shudder at what poor Reepicheep might find. Then again, I'd take great delight in seeing him whip Gregor's arse! the middle earth is the earth in ancient times? Good map, kinda sorry you didn't include Equestria on it. There is "westeros" but not "Hyboria" ? Let's play the "Totally Looks Like" Game! "In bed by nine? That's when life just begins! "